In October 2015, Alaska Department of Revenue officials lent $22.5 million to support a small but challenged North Slope oil project. The loan was unique among the department’s investments not for the fact that the state was participating in a private sector project, but for the other circumstances that spurred it and who it was made to. On Oct. 1 of that year the Department of Revenue finalized a $22.5 million line of credit agreement with Mustang Operations Center-1, or MOC1 LLC, to provide the company with capital to continue advancing the Mustang oil project. Located in the Southern Miluveach Unit adjacent to the large Kuparuk River field on the central North Slope, Mustang could produce upward of 12,000 barrels of oil per day from a resource of about 22 million barrels when the project is complete, according to estimates from Brooks Range Petroleum Corp. The loan was made to MOC1 and not Brooks Range because of a partnership the operating company had with the Alaska Industrial Development and Export Authority, the state-owed development bank. In December 2012, AIDEA invested $20 million of the $27 million needed to build a five-mile road to Mustang and a 19-acre pad for production and processing facilities. The gravel road and pad — in which AIDEA was an 80 percent owner — were finished in April 2013. The gravel road and pad have since been used by other oil companies as an access route and staging area for winter exploration drilling programs. At the time, Brooks Range leaders said they wanted to have the field in production by fall 2014 and credited incentives in the just-passed and industry-supported oil production tax structure under Senate Bill 21 for improving the economics of the project and spurring it forward. In April 2014, AIDEA committed another $50 million equity investment in the $225 million Mustang oil processing facility through MOC1. AIDEA held a 96 percent stake in the holding company as Brooks Range’s owners matched the authority’s equity with a $1 million investment of their own. Brooks Range Chief Operating Officer Bart Armfield said at the time that the project would start production in late 2015 and likely hit peak production in 2017. Full development of the field was estimated to cost about $580 million and included drilling 11 production and 20 more gas and water injection wells, but now is estimated at greater than $750 million, according to AIDEA. AIDEA’s $50 million was to be repaid with 10 percent annual interest within seven years after the start of oil production from Mustang, or by the end of 2022, according to a memo from AIDEA staff to the board of directors when the investment was approved. AIDEA’s equity was also key to Brooks Range’s ability to secure loans to finance the remainder of the project, authority and company officials said when the deal was made. Much of the payback to the authority was to come in the form of refundable oil and gas tax credit payments Brooks Range was set to receive from the Department of Revenue for the tax credit-eligible work the company would perform on the project. Now the president of Brooks Range, Armfield wrote in a December 2015 letter to then-Natural Resources Commissioner Mark Myers that the company had spent $145 million on facility engineering, reservoir evaluation, permitting, drilling and other expenses to move Mustang forward. That ended up being a problem for the project because — in addition to low oil prices challenging its economics — Gov. Bill Walker in June 2015 vetoed $200 million in tax credit payments from an overall $700 million tax credit appropriation that was to be spread amongst numerous credit holders. Limiting the 2015 tax credit payment was Walker’s first step towards ending the program, which he and others saw as unsustainable given the oil price decline had pushed the state into several years of budget deficits in the range of $3 billion or more. He vetoed another $430 million in tax credit payments in 2016 and the state Legislature has since further limited its tax credit appropriations in subsequent state budgets. Paying off the tax credits quickly became a large piece of negotiations between the Walker administration and legislators over a long-term fiscal plan to resolve the structural budget deficits. That’s where the loan comes in. Then-Revenue Commissioner Randy Hoffbeck said in an interview that the loan was made because the state “already had skin in the game through AIDEA” and officials did not want to see the authority’s investment lost. While loans were not offered to other companies holding tax credit certificates, it was determined the loan to MOC1 could be made under the department’s investment policies, according to Hoffbeck. Hoffbeck retired from the state in August 2017. The $22.5 million originally came with 7 percent simple interest and a maturity date of Dec. 31, 2016. However, Walker’s second credit payment veto, on top of oil prices that made Brooks Range’s owners hesitant to advance the project, made repayment difficult. “It was supposed to be a one-year loan and then like everybody else that had loans against tax credits we were in the same position. We all had to get in line and wait for the credits to be paid,” Hoffbeck said, noting the loan continued to accrue 7 percent interest while it went unpaid. According to an April 6 report regarding the loan from newly appointed Deputy Revenue Commissioner Mike Barnhill to the Legislative Budget and Audit Committee, $19.7 million remained to be repaid as of last spring. A $1.6 million interest payment was made on Feb. 2. Hoffbeck said discussions before the loan was made were primarily between Revenue officials and Brooks Range representatives; AIDEA officials were kept “in the loop,” he said. Hoffbeck remembers a suggestion to make the loan coming from Walker’s then-chief of staff Jim Whitaker, but said he wasn’t sure if the governor was involved in those discussions. Whitaker said he remembers Hoffbeck initially balking at the idea because it had never been done before and the commissioner said he would have to evaluate it against the department’s investment criteria. The Department of Revenue continually invests state money, including that in state savings accounts, which are invested conservatively in things that can be liquidated quickly for cash management purposes. There were a number of “brainstorming sessions” among folks within the administration on various ways to see the state through the severe financial situation Alaska was suddenly facing, Whitaker said, adding that he didn’t remember who first spawned the idea for the loan to MOC1. In fact, he was surprised a couple months later when he heard the loan had been made given Hoffbeck’s initial response. AIDEA board of directors chairman Dana Pruhs said someone on the board at some point in late 2015 or early 2016 asked about the status of the deal with Brooks Range given Walker had vetoed part of the tax credit payments, which was generally a popular topic in Alaska business circles at the time. It was around then that the board was made aware of the loan to MOC1, according to Pruhs. To his knowledge, the loan concept did not come from anyone at the authority; he surmised it originated from within Revenue or Brooks Range. Others said they were informed of the loan earlier in 2018. The April report from Revenue’s Barnhill includes 2015 loan documents signed by now-retired AIDEA project manager Jim Hemsath and Brooks Range representatives as directors of MOC1 LLC. Whitaker did stress that AIDEA leaders did not come up with the plan and were generally ambivalent to the idea when it was brought up to them. “AIDEA didn’t come knocking on the door and say, ‘hey, we’ve got exposure. We’d essentially like to provide a bridge loan to these guys,’” he said. Walker said in an interview that he was generally aware of AIDEA’s partnership with Brooks Range made under Gov. Sean Parnell’s administration, but he was not at all focused on the specifics of the issue. The loan was not made because of a directive from his office, Walker said. In hindsight, Whitaker said the loan was still a “pretty safe bet” in that the state was collateralizing itself with tax credits that will eventually be repaid. The Walker administration’s plan to sell bonds to pay for the more than $800 million in outstanding tax credits — championed by current Revenue Commissioner Sheldon Fisher — is being challenged in state Superior Court on constitutionality grounds. The loan largely flew under the radar until late May when Legislative Budget and Audit Committee chair Sen. Bert Stedman requested an audit of Revenue’s Tax Credit Loan Program. Specifically, Stedman asked for auditors to evaluate whether the loan was accurately reported for the state’s financial statements; how broadly the program was used and whether or not loans were offered to other credit holders; whether any conflicts of interest existed amongst state personnel; and how it might relate to the Legislature’s appropriation authority. A committee staffer said Stedman couldn’t comment on the matter because the audit is ongoing. Records provided to the Journal by Revenue officials indicate the loan was reported in the state's accounting system. A version of the Treasury Division’s Investment Policies and Procedures dated Nov. 3, 2014, does not list tax credit-backed loans as approved GeFONSI Pool investments. However, an updated issuance of the exhaustive document dated Jan. 23, 2018, states that as of July 1, 2017, up to 2 percent of the GeFONSI Pool investments could be made in tax credit loans. Barnhill’s report says the policy change was made in July 2016. Hoffbeck said he didn’t remember signing off on the change in investment policy. “It was a straight up deal, one of those that didn’t play out quite the way we intended but it was certainly something that made sense at the time,” he said. Barnhill’s report also states that Revenue asked the AIDEA board to assume the $19.7 million outstanding debt and that the authority had asked for further forbearance as it sought to sell MOC1 to Brooks Range. On Sept. 19, AIDEA did just that. The authority board unanimously approved a deal to sell MOC1 and the similar Mustang Road LLC to Brooks Range’s parent company, Caracol Petroleum for $64 million in the form of a seller-financed loan with 8 percent interest. 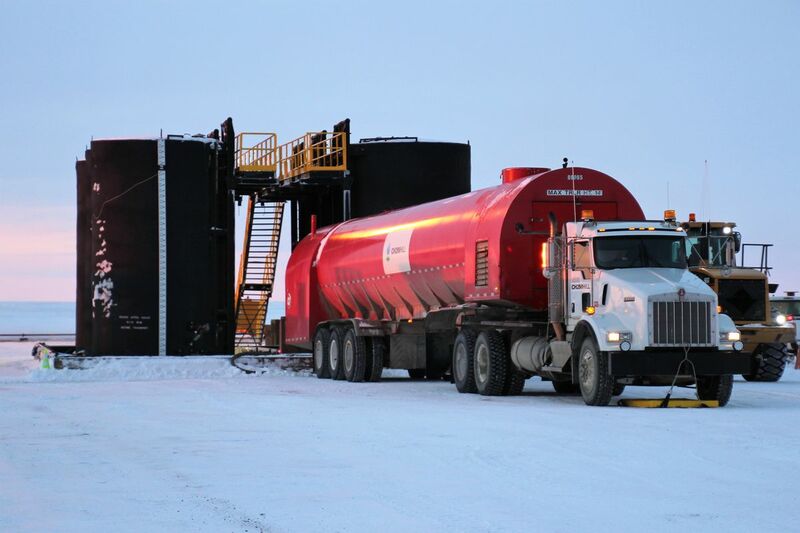 The loan is scheduled to mature April 1, 2026, and quarterly payments are set to commence May 1, 2019, which would be about the time Brooks Range now expects to start oil production at Mustang. Division of Oil and Gas Deputy Director Jim Beckham approved Brooks Range’s 2019 plan of development — the sixth for the project — Oct. 31. Division officials have approved the company’s plans for the Southern Miluveach Unit in recent years while also expressing concern that the company has consistently missed promised timelines in developing the Mustang project. The company currently expects to start production in the first or second quarter of 2019 from a modular “early production facility” with capacity to handle up to about 6,000 barrels of oil per day. Subsequent drilling development drilling could occur later this year, according to the company’s filings with the state. Brooks Range’s Armfield was unavailable for comment on the company’s progress in time for this story. Pruhs said he feels the investment environment surrounding oil and gas projects has improved and the oil is still there for the taking. Whitaker said he’s comfortable with the loan and suggested Stedman should’ve discussed the situation with administration officials before requesting the audit.